I'm sure I've mentioned it before but 3 years ago Chris's parents bought a fixer-upper lake house in AR. And they've steadily been working on it almost every weekend for 3 years. It's really coming together! Especially since I haven't been over there since I was pregnant with Cody. Just this past month they got new siding and a shiny new roof put on and the place is looking great (from the outside). Chris was supposed to work upstairs in the attic Saturday but the yard needed some TLC. So we decided to work really hard in the yard all morning, blow off nap time, and meet up with Ma and Pa Schwartz at the lake after they finished up some work on the house. 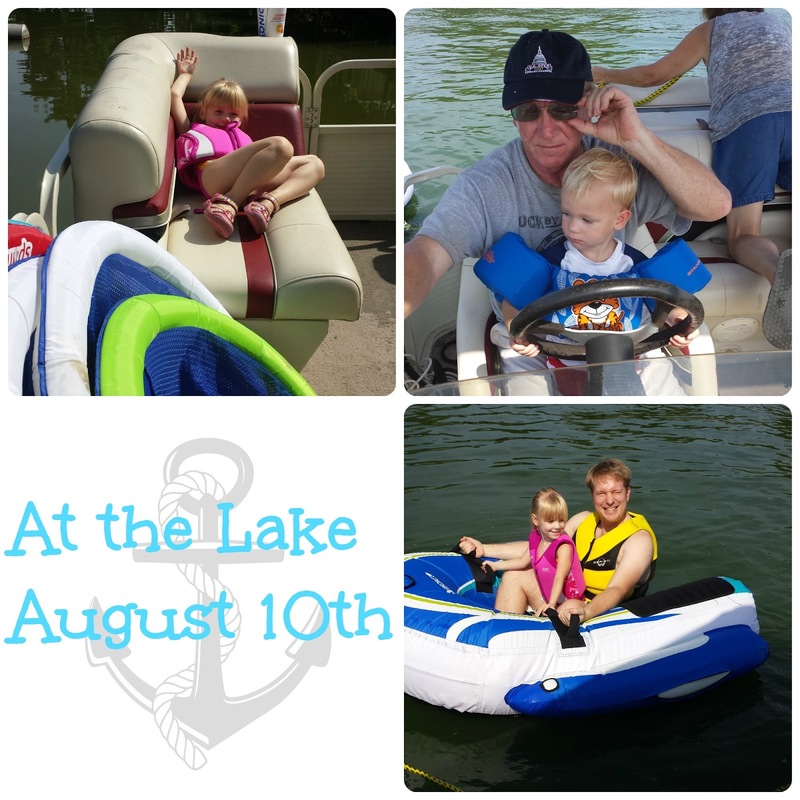 The kids were so good all morning and very excited to go and see Grandma and Grandpa's boat. When we got there they ran around the guts of the house and out to the deck Cody leading the charge yelling, "A boooooaaattttt! Boat! Boat!" And Sarah was dying to change into her swim stuff. As soon as we hoped on the boat Sarah made herself comfortable saying, "I'm going to sit like this!" (top left) While Cody walked around the boat but mostly just wanted to drive it. After we got out of the canal it was time to start tubing. I've never been tubing before. I was a little worried Sarah would freak out and hate it but she LOVED it! She was very upset when it wasn't her turn. After Chris and Sarah took the first ride on the tube it was time for Cody and me to give it a try. From the minute we got in the tube Cody hated it. He was yelling "Daddy!!!!" and crying. I distracted him for a few minutes trying to get him to look for fish. But that only lasted briefly then he mustered all the enunciation he could and said very clearly, "Get. Off. Please." Pausing between each word to make sure he was understood. So I signaled to daddy and we stopped. That was the last time he got on the tube. Then Sarah rode with Grandpa and had a great time. 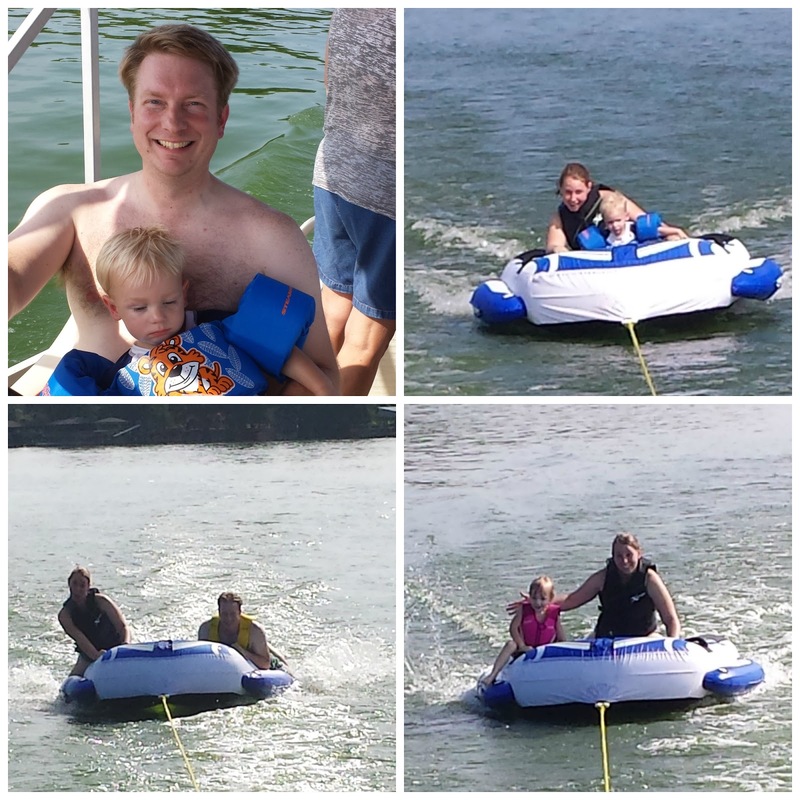 Chris drove the boat and somehow managed to toss Grandpa off the tube, but Sarah hung on like a champ. Which then lead to Chris and I riding and basically trying to do stupid things to get thrown off the tube. We were bouncing on it and leaning too far off to the side. After being thrown a fair number of times it was time to throw in the anchor and swim for a bit. Sarah was fearless swimming around and jumping off the boat into the water. Cody was forced in and unhappy about it. He wanted back on the boat and saw his chance when he noticed Chris was lifting Sarah out of the water onto the boat so she could jump in. He quickly yelled, "My turn!" And then ran to the back of the boat after he was lifted on to it. That was the last time he got in the water. But he did have a great time. 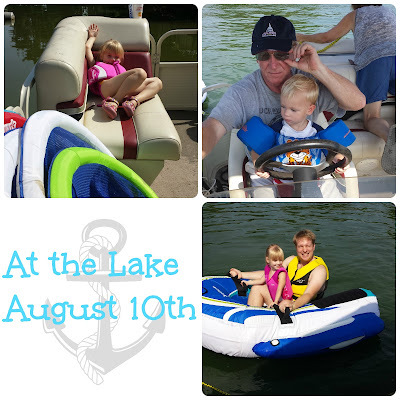 He just wanted to spend his time running around on the boat instead of playing in the lake. After a little more tubing, and my first time driving the boat which was likened unto a drunk driver it was time to head back and grill some hot dogs. It's funny to me now that they've had the lake house for 3 years and we've only been 2 times. I don't know why we don't go more often. I guess we need to start having Chris get up and work in the attic earlier and quit around 2 or 2:30. Then we could head to the lake house to cool off and relax. Of course, if he would finish our upstairs he could just go over to the lake house more often to help out and that could get finished more quickly too. Alas, there are only so many hours in a Saturday and only so many Saturdays in year. But right now I'm checking the calendar to see when is the next free Saturday to go to the lake.